Bow number 24... installed, the boat is light, the bottom clean. The race day ended well for AVERISERA and crew. We finished! A lot of boats didn't make it through the fog and light air. Club Car, a slippery little S2 7.9 placed first in our class, Averisera was second and Tabu third. Our crew: Tom Brown drove. Well actually that was the plan, Elizabeth drove leaving her usual spot as Skipper/Navigator empty. 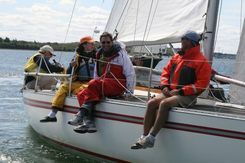 Tom coached and we all had to chuckle knowing that Norm the sailing instructor could not have done a better job. Thanks, Elizabeth for a good job. Gladie and Mike helped on deck. Norm ran the bow. Stacey trimmed. 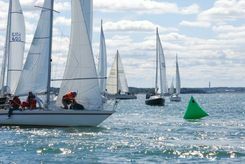 The upshot of it all is that our little boat placed second overall in the Mass Bay Sailing Association Pursuit Championships. The season ends on a high note. Over the years, we have had all the random issues with the engine that one could imagine. In truth, Thumper has also taken pretty good care of us most of the times it really mattered. Not as if Thumper has a brain and can decide to run nor not run. It just runs most of the time. Once in a while, it just loses power. Thumper may even stop running, require one of us to bleed the fuel system, and then restart. Recently, these events got to be a bit too closely spaced for comfort. Bleeding the air is the fix. Does it follow that air in the fuel line is the problem? We have checked the fuel lines including some fretting about the fuel pick up in the fuel tank. That's the expensive and messy "fix." Check the primary fuel filter. Check the fuel lines and connections. Finally, replace the fuel pump. The problem seems to be running better but never with that steady thrum for which every boat owner searches. The good news is that we have a high degree of comfort taking the Yanmar 1GM diesel apart and putting it back together again. Thanks to Phil DiPrima for snapping this picture of the Averisera crew at ease before the start of the race. 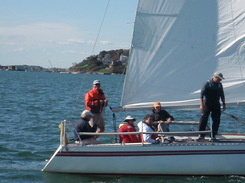 Hull Yacht Club runs a pursuit race each year in the waters of Hull and Hingham Bays. The course is about 11 nm. It is organized as a windward/leeward rectangle-ish track. The long legs are about 2 miles each. 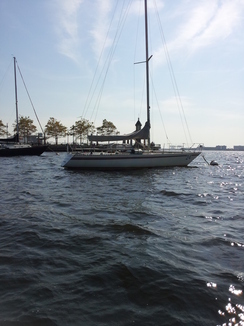 Averisera finished 7th out of 22 in class and 41st out of 125 in fleet. This puts our Mass Bay PHRF Pursuit Race cumulative standing as second with 74 points. 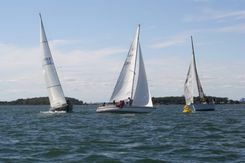 Constitution YC boats, Superstition and Cone of Silence are scored with 84 and 71 respectively. A few images of the boat taken by the Hull YC photo boat. The take-away from this race is about clear air. with almost 80 boats starting ahead of us, the start is a stream of boats all on starboard at the RC. We cleared our air quickly and beat well to the top mark for a drift around with probably 40 boats in our cluster. The second leg, we did not sail to clear air quickly as we were looking for the second mark, and lost the opportunity to sail past 30 to 40 boats. Had we played the game a little smarter, we'd have finshed higher. Next time.